You will either love this book or hate it. It has a limited target audience. 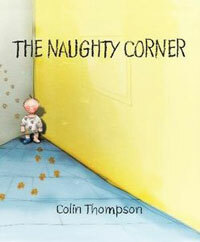 It is completely unsuitable to read to other people’s children (so inappropriate in pre schools and junior classes). It is unlikely to appeal to young parents or indeed any parents who take their roles very seriously. But it should be a runaway success in families with older children, more relaxed parents or with fathers who lean to the subversive (and would build shelves in the naughty corner to hold stuff so they don’t get bored when made to spend time there). The basic premise is that life is a lot more fun if you are naughty. The illustrations are beautifully stylised and characterised. Littlies will love this book because their older siblings and parents will find it hysterically funny as they read it aloud. Buy it for friends who are having an additional late child. It is quite the funniest picture book I have seen in a long time.